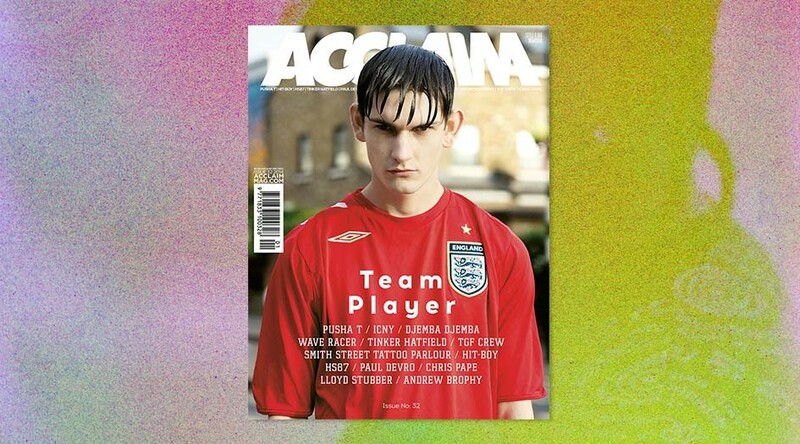 Today we’re incredibly hyped to announce our first issue of 2014, the ‘Team Player’ issue, will be hitting stands locally and internationally from early next week. We all know how hard it is to achieve our goals without the backing of a good team, and in this installment of the magazine we pay tribute to all those who work together to create, inspire, and realise their ambitions. This edition is dedicated to exploring creative collaboration, to examine combined outputs and shared visions. It’s a testament to the successes that are made possible only by the collective efforts of a team working in unison, and an exploration of what makes these groups work. Contents include Pusha T, Hit-Boy, HS87, Tinker Hatfield, Paul Devro, Lloyd Stubber, Smith Street Tattoo Parlour, Andrew Brophy, TGF crew, Chris Pape, and a whole stack more. This issue of ACCLAIM features two unique covers. The general release highlights Jo Duck’s football inspired shoot on location in London, while Clement Pascal shot our boutique cover star Pusha T in the midst of the New York blizzard. Preorder are available right now via our online shop, or you can pick up a copy in store from one of our stockists from Monday, April 14th.